We drove a little over an hour away from our home to catch a glimpse of our newest family member! Richard, the kids and I met my parents at the 3D ultrasound facility. After filling out some paperwork, then having my belly squirted with gel, we caught our first glimpses of our little one. 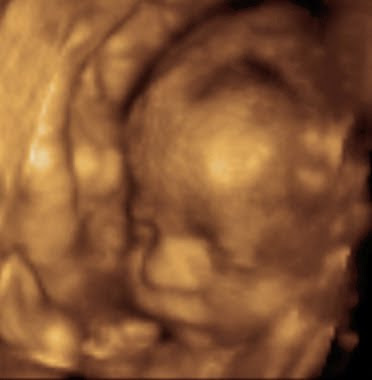 Baby had its hand (and later, its feet) close to its face most of the time, but we were able to get some good shots. We're a bit disappointed with the video - it's not as clear as the pictures - but the pictures are great! Best of all, we told the tech we didn't want to know the gender and... the tech didn't let us down. Baby's secret is still SAFE! I can't stop staring at the pictures!!! What a thrilling experience! Angie, that is so wonderful!!! What a cutie! Awe... I love the 3d's. Congratulations on breaking the 100 days until baby is born marker. What a wonderful treasure to have! I am thrilled for you. That is SO amazing. I can't believe how clear that is!! !